The smart has pretty much been a love it or leave design; those that appreciate the compact size (it's only 8 1/2 feet long) and ease with which you can find a space to park it can appreciate it. It cabrio (or convertible) form, the insulated top (cloth) can roll back to several positions; leave the side rails in and it's like a targa top; remove the pop-out side roof rails and it's a full convertible. Lots of color combos so you can match or contrast with the 'tridion' roll cage color. We enjoyed our '08 smart coupe but felt it was time for a change; we looked at the electric-drive model but as it had limited range and we already own a LEAF, decided to go with a cabrio. MBZ smart has improved the shift points on the automatic as well as it has a bit better ride (perhaps being new also helps). On a recent visit out west, especially in urban areas, we saw lots of smarts tucked away in parking spaces that bigger cars needed to pass up --- that's where this little car excels. In our own case, we have a tandem garage that will fit a VW Golf and this smart with about 8 to 10 inches of room to spare so it works for us as well. The fit and finish is quite good and the white/silver tridion/black cloth top combo is a winner in our opinion. 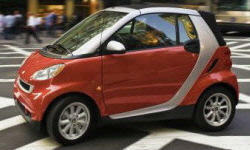 See TrueDelta's information for all smart models.